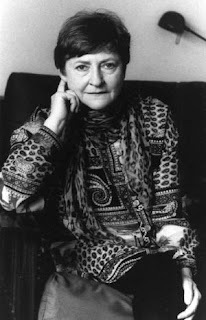 Rosmarie Waldrop was born in Kitzingen am Main, Germany, in 1935. At age 10 she spent half a year acting with a traveling theater, but was happy when schools reopened and she could settle for the quieter pleasures of reading and writing which she has since pursued in and out of universities (Würzburg, Freiburg, Aix-Marseille and Michigan, Ph.D., 1966), in several countries, but mostly in Providence, RI where she lives with Keith Waldrop (with whom she also co-edits Burning Deck Press). She taught at Wesleyan University and, as occasional visitor, at Tufts and Brown. The linguistic displacement from German to English has not only made her into a translator, but gave her a sense of writing as exploration of what happens between. Between words, sentences, people, cultures. Books of poetry include the trilogy Curves to the Apple (The Reproduction of Profiles, Lawn of Excluded Middle and Reluctant Gravities), Blindsight, and A Key Into the Language of America (all from New Directions), Love, Like Pronouns (Omnidawn), Another Language: Selected Poems (Talisman House), Split Infinites (Singing Horse Press). Her collected essays, Dissonance (if you are interested), was published by University of Alabama Press in Fall 2005. Her two novels, The Hanky of Pippin’s Daughter and A Form/of Taking/It All (originally published by Station Hill) are available in one paperback (Northwestern UP). She has translated 14 volumes of Edmond Jabès's work (The Book of Questions, The Book of Resemblances, etc.). Her memoir/study, Lavish Absence: Recalling and Rereading Edmond Jabès, was published by Wesleyan University Press. She has also translated, from the French, Jacques Roubaud (most recently, with Keith Waldrop, The Form of a City Changes Faster, Alas, Than the Human Heart (Dalkey Archive) and Emmanuel Hocquard; from the German, Friederike Mayröcker, Elke Erb, Oskar Pastior, Gerhard Rühm, Ulf Stolterfoht, and others. The fact that THE AGGRESSIVE WAYS OF THE CASUAL STRANGER was published alleviated my insecurity, at least socially. It made it easier to say, I'm a poet. 2 - How long have you lived in Providence, and how does geography, if at all, impact on your writing? Does race or gender make any impact on your work? that's a lot of questions masquerading as one. Since then I've translated much Edmond Jabès and have come to agree with him that a writer's only real place is in her books. Of course we're both expatriates! I know many writers are strongly rooted in a landscape. The fact that I am a woman clearly shapes my writing: thematically, in attitude, in awareness of social conditioning, marginality—but does not determine it exclusively. The writer, male or female, is only one partner in the process of writing. Language, in its full range, is the other, and is beyond gender. In spite of Lacan's attempt at appropriation and in spite of our language declaring that "man" means human being. The language a poet enters into belongs as much to the mothers as to the fathers. They are a sounding board that can make me hear problems I hadn't noticed while working by myself. More precisely, I'm mostly exploring syntax rather than vocabulary or images. Depends. I usually appreciate the new perspective and what I can learn from it. All writing is hard. If anything it has been getting harder. Do I dare to eat a pear? I mostly opt for cheese instead. Can't think of anything--I suppose that means I don't listen to advice! I write mostly prose poems now. I suppose that means settling in the between-genres. The prose paragraph has a spaciousness where form can prove “a center around which, not a box within which” (Ezra Pound). Or as Emily Dickinson wrote in a letter: "Moving on in the Dark like Loaded Boats at Night, though there is no Course, there is Boundlessness." I love this "though!" I always WANT to have a writing routine, but I never manage to. Every book feels completely different to me. When I put a Selected Poems together I was surprised (and rather relieved) to see how much continuity there actually is in my work. McFadden is right. Music used to be a big factor for me. Poems used to start with a rhythm, but much less so now. What science I've used of course came from books too. This should be a HUGE list. But let's say, some writers I keep going back to: Kafka, Musil, Dickinson, Pound, Rilke, Oppen, Wittgenstein, Merleau-Ponty, Queneau, W.G.Sebald, Yoel Hoffmann, Lyn Hejinian, Mei-mei Berssenbrugge, Marjorie Welish, Guy Davenport, and of course Keith Waldrop. Go to Mexico and see the pyramids. Books were always my world. THE BOOK OF BLANCHE AND MARIE by Per Olof Enquist. THE WERCKMEISTER HARMONIES by Bela Tarr. Poems that work with a vocabulary derived from the definitions of certain key words. Reading books about the brain with the hope that this will lead to poems. Translating younger German poets for a magazine issue of Burning Deck's "Dichten=" series. Typesetting the next Burning Deck book: DWELLING by Heather C. Akerberg.